1. NARS Yachiyo Brush - This is a new brush for me and yes, I fell victim to all the hype surrounding it. Truth be told, I was not a fan when I first used it. It was too tapered, too small and didn't blend well on my skin. Fast forward a few months and a lot of use later, and it has finally become a staple in my makeup routine. The bristles began to open up a bit more and the shape was a bit less tapered which made it great for contouring my cheeks and applying highlighter. 2. MAC #129 Brush - This brush has been in my collection for more than 10 years, so that should tell you how important it is to invest in good brushes. It is still in great condition (minor wear and tear) and I suspect it will last me another 10 years. Because it is a slightly more voluminous brush, I like to use this when applying blushes and bronzer with minimal pigmentation. I find that more tapered brushes give me better control with intensely pigmented products, and fluffier brushes are best with blushes that don't need a precise application. 3. Real Techniques Stippling Brush - Perfect for foundation, cream highlighters and blush, this duo fibre Real Techniques brush has been a favorite for a long time. It's very affordable while still maintaining superior quality. This brush can leave brush strokes on occasion so I do have to ensure I use it with thicker foundation and/or blush formulas. 4. Sephora Pro Airbrush #55 - This is the newest member of my foundation brush collection and was purchased purely off reviews and fellow blogger buzz. People were raving about its ability to create a true airbrushed finish, so I had to see for myself. Happily, all of the reviews were right - it is quite a unique brush. Because the hair is a bit longer, the brush moves a lot during the application which gives it the ability to create a smooth finish on the face. The only challenge I have is because it's not dense and stiff, I have a harder time getting an even application around my nose. I usually just grab one of my Real Techniques brushes to help finish the job and it works perfectly. Other than that one aspect, I truly love the finish this brush gives to my skin. 5. Giorgio Armani Blender Brush - When I need a more precise application for my foundation or cream blush/highlighter, I like using a stiff synthetic brush like this one from Armani. It gives me more control and instead of swiping it up and down my skin, I tend to use a stippling or patting motion to get the desired result. Especially with heavily pigmented cream blushes, this brush allows for a gorgeous sheer wash of color. 6. Hourglass Blush Brush - If my Sephora Pro Airbrush, my MAC #129 brush and my Real Techniques brushes had a baby, it would be this Hourglass Blush Brush. It a nice combination of stiff yet fluffy with a nice rounded tip that allows for precise application or a nice dusting over the face. I have used it for liquid foundation and love the finish it gives, but prefer it for powder blush. It's not wide enough or large enough for bronzer in my opinion and not precise enough for highlighter - it falls right in the middle and works great for those neutral blush colors I wear on a regular basis. 7. Real Techniques Contour Brush - This is exclusively my concealer brush. I know it can probably be used for a myriad of products, but I love the shape for my under eye area. It fits perfectly and helps to blend out my concealer beautifully. I learned to use a fluffier brush under the eyes many years ago to achieve a more airbrushed and blended finish and have never stopped using that the technique. 8. MAC #150 Brush - While I typically use a powder puff (I love this one) to press my loose setting powders into my skin, I still love a large powder brush for dusting on finishing powders and/or bronzers. This MAC brush has been a staple in my collection for 10+ years and it always gets the job done with minimal shedding. 9. Bobbi Brown Blush Brush - This is my first Bobbi Brown brush and I was quite impressed with how well it has performed. I like to use the side of the brush more than the tip simply because I find it does a better job at blending out highly pigmented blushes into a wearable flush of color on the cheeks. It may be my first BB brush, but after using it almost every day for the past few months, it certainly won't be my last. 10. MAC #116 Brush - While many may find the smaller shape of this brush to be perfect for contouring, I use this brush specifically for highlighting. The flat sides of the brush allow for me to tap the highlighter onto my cheek bones and then buff it into the skin for a beautiful finish. In a pinch, however, it does work as a nice eyeshadow blender/crease brush because of it's slightly tapered shape. 11. Real Techniques Buffing Brush - If I had to pick a favorite brush out of my entire collection for applying foundation, this would be it. It is dense enough to give even coverage and fluffy enough to ensure the foundation is blended out well. It's the first brush I grab when I am going on vacation because I know I will get a gorgeous application every single time. 12. Shu Uemura Natural Brush 18R Red - I initially thought this powder brush would be great at applying loose powder or finishing powders, I quickly found that the tapered shape would make this more invaluable than I anticipated. When I want a contour that is less defined and precise, I reach for this brush every time. I specifically love it when applying bronzer around my hairline and across my cheekbones because the shape of the brush allows the product to be dispersed in a larger area while still ensuring you can keep some definition with the placement. 13. Beautyblender - Though I am super late to the party, I am finally here. I have heard people rave about the power of the Beautyblender for years, yet I was not convinced. I tried the white one initially and was not pleased. It streaked and left my skin with an uneven application every time. But people kept telling me that the pink one would change my life - and they were right. Since the Beautyblender is best used wet, I find that it gives a beautiful dewy finish to whatever foundation I am using. I do adore the look of my skin after using it, but I always need to use a mattifying setting powder on top to help balance out the radiant finish. I thought this would deter me a bit, but surprisingly it hasn't and I reach for my Beautyblender all the time. As suggested, I use a swiping and bouncing motion to apply foundation and love that it leaves no streaks or splotchy spots on my skin. I didn't think I would ever say it, but I am now drinking the Beautyblender Kool-Aid. Amazing review, thanks for sharing! 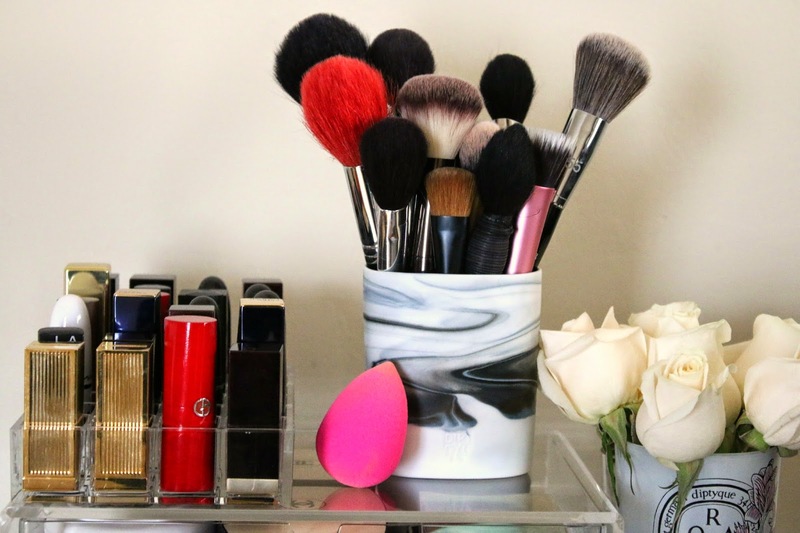 Curious if you've ever tried Bobbi Brown's Full Cover Face Brush? Wanting to try it... would love your thoughts! Having totally drunk the "Kool-Aid" I completely get it... loving the application lately with the beauty blender. I was certain I could never "cheat" on my Real Techniques brush! Hah! 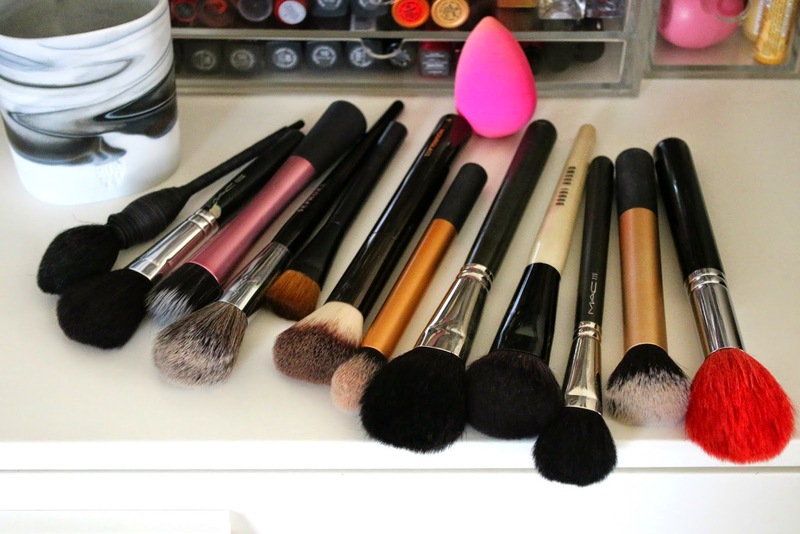 i love brushes and the beautyblender too, but I tend to be a finger-applier when it comes to alot of products. Not sure why lol. I actually think the beautyblender does a nicer version of finger application, when it comes to foundation!